This page summarizes the optical absorption and emission data of Anthracene that is available in the PhotochemCAD package, version 2.1a (Du 1998, Dixon 2005). I reworked their data to produce these interactive graphs and to provide direct links to text files containing the raw and manipulated data. Although I have tried to be careful, I may have introduced some errors; the cautious user is advised to compare these results with the original sources. This optical absorption measurement of Anthracene were made by R.-C. A. Fuh on 06-26-1995 using a Cary 3. The absorption values were collected using a spectral bandwidth of 1.0 nm, a signal averaging time of 0.133 sec, a data interval of 0.25 nm, and a scan rate of 112.5 nm/min. These measurements were scaled to make the molar extinction coefficient match the value of 9,700cm-1/M at 356.2nm (Berlman, 1971). The fluorescence emission spectrum of Anthracene dissolved in cyclohexane. The excitation wavelength was 350nm. 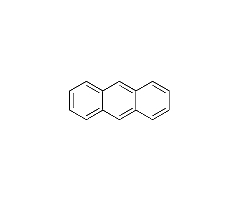 The quantum yield of this molecule is 0.36 (Berlman, 1971). This spectrum was collected by on 06-26-1995 using a Spex FluoroMax. The excitation and emission monochromators were set at 1 mm, giving a spectral bandwidth of 4.25 nm. The data interval was 0.5 nm and the integration time was 2.0 sec. Other fluorescence yields include 0.27 in ethanol (Dawson, 1968; Eaton, 1988). Berlman, I. B. (1971) ÃÂ¢ÃÂÃÂHandbook of Fluorescence Spectra of Aromatic Molecules,ÃÂ¢ÃÂÃÂ Academic Press, N.Y.
Dawson, W. R. and M. W. Windsor (1968) Fluorescence yields of aromatic compounds. J. Phys. Chem. 72, 3251-3260. Eaton, D. F. (1988) Reference materials for fluorescence measurement. Pure Appl. Chem. 60, 1107-1114.